YES! The Shadowhunters TV series is finally around and kicking on its first and second episode in Freeform, which as we may have all known, was ABC Family. The pilot aired on January 12, which was a dreadful Tuesday for me because I had matters to work on at Uni. I had to stay away from tumblr (and even a bit of twitter too) to avoid seeing GIFS and edits and etcetera. I wasn't able to watch it until Wednesday, just because I had to recover from the crankiness. To be honest, my feelings on the series were pretty much conflicting. I was excited because it was my favorite book series (after The Infernal Devices though) coming to life with beautiful actors bringing my favorite heroes to life. 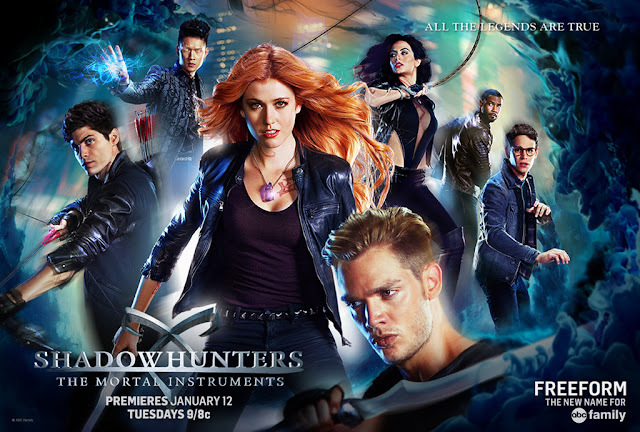 Meanwhile, on some part of my heart, I wanted to put off watching the series for a while because I kind of knew in my heart that despite the fact that I am going to see the world of my favorite Shadowhunter heroes, it won't feel and look the same way when I was reading about them. I wouldn't be able to finish this post if I don't stop enumerating the changes here. But hey, having the changes is actually fine. The thing is, this isn't the book-- that is something that should be reminded to the readers. This is the TV series and it won't be nice to judge the TV series because of how it religiously synced itself to the book series. For now, I just want to trust in this TV series in how it will properly deliver this beloved Shadowhunter story the way the long-time Shadowhunter fans, and even newbies will love. I'm just looking forward to the TV series now, how it will develop, and how it will be (or not be maybe?) The Mortal Instruments in its own way. While the progress of the story because of the TV series changes made into City of Bones is something I am looking forward to seeing, the reason why I am actually excited for this TV series's progress is the actors bringing the beloved Shadowhunter characters to life. Now, onto my most awaited and thought-about part of this post: the actor portrayal/acting commentary. My favorite so far was Alberto Rosende. Alberto was killing his Simon! It was perfect-- geeky and awkward and quirky in every way! I connected with him right away. he didn't lack in making me feel his protectiveness towards Clary. Now, I just know I am going to love him. Other actors who have done A+ performances I loved were Isaiah Mustafa and Vanessa Matsui. Mustafa's Luke was on point and I just felt his acting. I know that Luke's characterization is altered in this TV show but I think I'm going to like it. On the other hand, Vanessa Matsui's Madame Dot was badass and terrific too. I didn't expect her characterization to be the way she is currently characterized now even if it was already made clear that Dot would be very different from the book's Madame Dorothea. I found her interesting as well. Meanwhile, I thought Dom Sherwood was still lacking on his Jace. I just didn't feel his acting so much in the duration of the first two episodes. I think I found him still trying to find the Jace in him. Or he just hasn't gathered up all his "Jace" yet? I'm looking forward to seeing him give more for the next episodes. As for Izzy, I know I shouldn't be disturbed about her being flirty because I think it was one of the changes they applied to her character. Don't get me wrong, Emeraude Toubia killed in her acting. She was excellent in it, its just that I knew Izzy differently that's why I felt it was off and I kind of didn't like the idea of Izzy being that way. All in all, I'm still trying to process everything out properly. I'm not used to watching these book-to-TV series adaptations, much less seeing my favorite book series turned into a TV show. I woudn't say I feel attached to it already because I didn't feel like the first episode already deserved a "Wow!" from me, but I'm looking foward to developments of the cast and of the upcoming episodes as well. 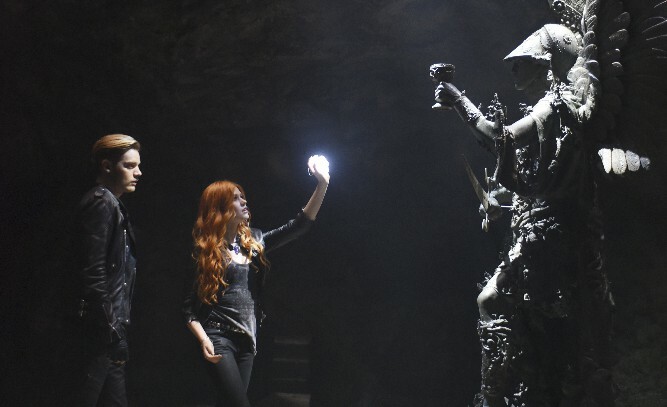 To end this post, here's a still of Jace and Clary (spoiler-ish) in the City of Bones. This blog is full of everything under the sun, and beyond the galaxy as seen and known by an 18-year old girl called Mic. Book related thoughts, adventures under the sun, moon and stars, and my roof too. Share book reviews and ratings with Micaela, and even join a book club on Goodreads. Content by Micaela Joelle unless otherwise stated. Icons by Greenleaf Imaging. Simple theme. Powered by Blogger.